Greetings from Children of Mother Earth! When I left Singapore in 1998 to start an organization in India, my plans were small. “Children of Mother Earth (COME)” started as a small organization in my ancestral home in Pharsar village of Uttar Pradesh state. It was a humble beginning with 7 children initially. Never even in my wildest dreams I imagined that COME would expand over two states, set up three more centers and help over 2500 children. It was all made possible only through the selfless support by the kind hearts like you who stood by us in the thick and thin. This year was the 17th year of our operations in India and the 11th year of our collaboration with the Indian Railway. We are grateful to Mr. Manoj Sinha, Honourable Minister of State for Railways, who inaugurated the function organized by COME to celebrate the 11th anniversary of the collaboration with the Indian Railways. He extended all his support in helping the children in contact with the Railways all over India. COME joined hands with Railways in the year 2004 to establish a center for the children on the streets and living around the railway station. Railways provided us with spacious locations near the railway stations of Lucknow, Gorakhpur and Delhi Shahdara to setup centers for the underprivileged children. 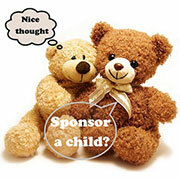 We are constantly trying to improve and expand our works for the disadvantaged children of India. We are glad to inform that with your generous support, 14 children undergo higher studies at present. The courses include Degree in Engineering (2 children), Diploma in Civil Engineering (8 children), BSc. Ophthalmology (1 child), BSc. Nursing (I child) and B.A (2 children). We have important projects at our hand which can bring great changes in the lives of many more children. Establishing a full-fledged school for the underprivileged children, starting a vocational center for the poor children from the villages and setting up kiosks for the children in contact with the railways at the major railway stations of India, are few among the envisioned projects which needs immediate implementation. We seek continued support from every one of our well-wishers to improve the lives and add color to the dreams of the children in need. COME extends its heartfelt gratitude to all its supports who helped us to put smile back on the little faces we found in the slums, streets and villages. Without YOU this was not possible! 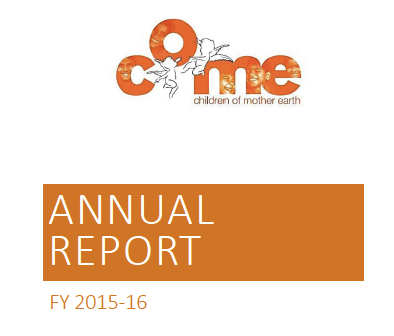 Please enjoy our Annual Report_2015-16 which describes the wonderful progress we have made in the last year.